A Unique Name For A Special VehicleNorth Freeway Hyundai is home to the all-new 2018 Hyundai Kona, a phenomenal choice for Houston drivers looking for a fun-to-drive subcompact SUV. With its energetic driving dynamics and user-friendly technology features, you can't go wrong by choosing the 2018 Hyundai Kona.The Hyundai Kona comes in 4 trims - SE, SEL, Limited and Ultimate - with front-wheel drive coming standard in all models. Additionally, the Kona offers several options to upgrade your driving experience at every turn. You can personalize your Kona with available colors such as Surf Blue, Lime Twist and Pulse Red.The Hyundai Kona crossover SUV is protected by an outstanding 5-year/60,000-mile limited warranty as well as a 10-year/100,000-mile powertrain warranty. This warranty also includes 5- Year/Unlimited Miles coverage for 24-hour Roadside Assistance. The 2018 Mazda CX-3 can't compare with its 3-year/36,000-mile warranty and 5-year/60,000-mile powertrain warranty. Most subcompact vehicles fall short just like the CX-3.You can get your hands on the all-new 2018 Hyundai Kona, first of its kind, at North Freeway Hyundai, your local Hyundai dealership today. The 2018 Hyundai Kona matches its dashing good looks on the exterior with a comfortable and stylish interior. The Kona seats 5 adults comfortably with roomy and spacious seating in both the front and the rear seats. With 94.1 cubic feet of overall passenger volume, cramped isn't in the vocabulary of the 2018 Kona. The 2018 Kona comes standard with Apple CarPlay™ and Android Auto™, a set of features that allow you to connect your phone for peak smartphone integration. The 2018 Honda HR-V doesn't even come standard with a touchscreen, let alone Apple CarPlay and Android Auto. The Toyota C-HR doesn't offer either of those features in any trim. With the Kona, you can also equip available features such as a sunroof, a head-up display, an 8-speaker audio system, wireless charging for your wireless devices and more. 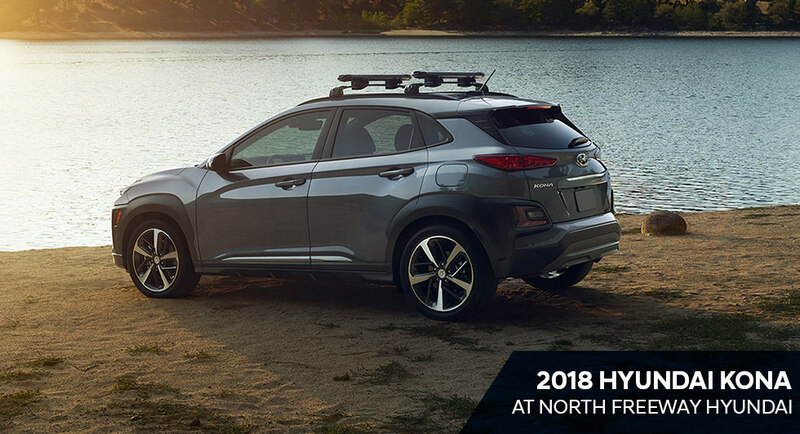 Experience the 2018 Hyundai Kona at North Freeway Hyundai when you stop in for a test drive today. Drivers have 2 engine options with the 2018 Hyundai Kona. The first one is a 147-horsepower 4- cylinder engine while the second option is a 175-horsepower turbocharged 4-cylinder engine that's available in higher trims. With the turbocharged engine, every drive will automatically become a real cool time. While each trim comes standard with front-wheel drive, all-wheel drive is available for any trim. The standard 2018 Kona earns an EPA-estimated 27 MPG in the city and 33 MPG on the highway. To compare, the "adventurous" Jeep Renegade won't fuel your expeditions for too long with its EPA estimates of 24 MPG in the city and 31 MPG on the highway. The Ford EcoSport can't even live up to its own name, earning a mere 29 MPG on the highway, falling short of the Kona's superiority in efficiency. Test-drive the 2018 Hyundai Kona at North Freeway Hyundai today to experience true performance from top to bottom. The 2018 Hyundai Kona prioritizes your safety with a litany of safety features that keep you and your passengers as secure as possible. The Kona offers available features including a Head-Up Display, Blind Spot Monitoring, Rear Cross Traffic Alert, Rear Parking Sensors, Lane Change Assist, Lane Keep Assist, Forward Collision Warning, Pedestrian Detection and more. All of these Driver Assistance technologies work in harmony to prevent accidents, and in the unfortunate case of any accident, the Kona will mitigate damage. Drivers in The Woodlands, Spring and Houston, TX can take advantage of our Hyundai dealer in Houston, where we offer the all-new 2018 Hyundai Kona. Our dealership is home to an extensive inventory of new Hyundai models, a large pre-owned vehicle inventory, Hyundai parts, a service department that offers oil changes among other services and more. Your next Hyundai Kona is sitting on our lot waiting for you to come for a test drive. Don't make it wait too long. Visit North Freeway Hyundai today. At North Freeway Hyundai, you can also opt for the Hyundai Kona Life Edition SUV. With this model, you can add a number of features included in the SEL trim to your Kona in addition to an optional technology package. This package includes features such as a sunroof, driver drowsiness monitoring, automatic emergency braking and more. The Kona Life Edition SUV comes with stylish design choices on the exterior and interior, including vibrant colors. If you're looking to make a mark on your life of commuting, the Kona Life Edition is perfect for you.